In a recent study done by Adobe, the email habits of 3000 European professionals were surveyed and the results were a combination of both shocking and expected numbers. The survey results helped to reaffirm the popularity of email and show that the use of email is continuing to climb upwards. Nearly 9 out of 10 (88%) survey respondents check their personal email accounts while at work, and 79% engage with their work email outside of office hours. Furthermore, 61% of respondents still check emails during their holidays, 59% admit to reading their emails while watching TV, and 42% check their emails in bed. Email is clearly a big component of many people’s personal and professional lives! As popular as email is becoming, marketing campaigns are not following suit. Out of all the branded email offers received, only 21% of emails were deemed interesting enough to open according to survey respondents. This number is even lower for work emails, with only 15% of branded emails being opened. In just one year, this number has fallen by 10% – sparking some notable concern about the future of email marketing. In Adobe’s survey, 22% of respondents indicated that their biggest annoyance with emails was the lack of a consistent display on their mobile devices, 23% indicated their greatest annoyance was having to scroll past one page, 29% agreed that it was due to poorly written content, and 22% agreed it was because they received offers based on erroneous profile information. This shows that there is a lot of room to adapt to the age of rising mobile users! Also, almost half (46%) of the survey respondents indicated that a high frequency of emails from brands was the biggest turn-off from a company. When it comes to emails, the trend is leaning towards producing quality mobile-friendly emails, not necessarily content in quantity. As an email marketer, it is your goal to produce quality emails for your audience, but where do you draw the line between quality and quantity for your messages? You don’t want to run the chances of sending too many emails in the eyes of your subscribers, because they will likely unsubscribe and not return. To give you an idea about the number of emails received daily by a user’s business email account, we included the table below from The Radicati Group. The table lists the average number of emails sent and received daily per user’s business email addresses. The average number of emails received are only expected to slightly increase over time, while the average number of emails sent will slightly decrease. The average number of received spam emails are also expected to increase with time. On average, a person will receive 76 legitimate emails every day. It makes you wonder how many of these emails are actually quality messages. On top of that, how many of those emails will actually be read by the user? What makes a quality email template? A quality email template has several vital components – ranging from the sender’s name, subject line, pre-header text, as well as the main content of the email and if it’s relevant to your audience. Pay great attention to these to encourage users to open your email. To be considered a quality email, it should be strategically designed to grab users’ attention with the few features that are visible even before opening the email: the sender’s name, subject, and pre-header. These should be carefully chosen! This is exactly why you should segment your audience into specific groups in order to send more targeted messages to your users. The groups you create can be based on shared demographic or behavioral characteristics, for example gender, age group, or which products your users commonly purchase. By creating specific groups to send emails to, you can personalize messages and only send relevant content that will interest your audience. This gives you a greater chance to capture their attention and generate conversions. What are the implications of these changing email habits? With current marketing campaigns struggling to engage their subscribers, it is important to adapt to the changing patterns of their audiences. As fewer branded emails are being opened, this means that email marketers cannot continue doing the same thing. Instead, they must take note about what is really catching people’s attention and develop creative solutions. As the survey respondents also indicated their greatest annoyances with emails – high frequency of emails, not optimized for mobile, and having to scroll past one page – this offers marketers a chance to adopt better practices with these grievances in mind, in order to keep their subscribers engaged. The problem isn’t that emails are becoming a less popular form of communication over time, because this is not the case. In fact, email, the oldest social channel, is more popular than it has ever been and the real problem lies with marketers that are failing to reach and engage their ever-changing audience. So, is there any good news for marketers? On the other hand, the results confirmed that the popularity of mobile devices are steadily on the rise as 74% of Europeans use their smartphones to check emails. In addition, the majority 58% of Europeans prefer for brands to contact them by email, above all other sources of communication. The time of mobile users is now. But what about for all age groups? In Adestra’s 2016 Consumer Adoption and Usage Study, they found that 40% of participants aged 14 to 18 years old will always read emails on their mobile devices first before checking it on their desktop, as will 29% of participants aged 19 to 34 years old, and only 8% of the group of 56 to 67 years old. However, the trend of rising mobile users does not appear to translate to the 56 to 67 years old age group. According to Adestra, 55% of consumers aged 56 to 67 years old indicate that they will never read an email on their mobile first. 35% of this age group indicated they will sometimes use their mobile device to read an email. 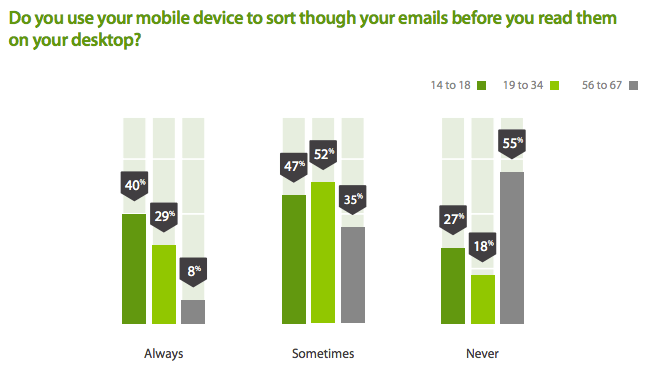 For the 19 to 34 year old age group, only 18% indicate that they will never read an email on their mobile device first. Therefore, providing mobile-friendly emails and webpages will likely be effective in capturing your younger audience’s attention, particularly the 19 to 34 years old age group. See the full results for this question below. Despite this rising trend of mobile users, some business and brands are still not catching on. According to Litmus, the number of businesses that use mobile-friendly emails in 2016 has increased to 72%, up from 48% in June 2015. In a study done by Litmus in June 2015, 48% of B2C brands had a mobile-friendly email design and webpage. Now, just one year later in June 2016, the number of businesses that use mobile-friendly emails has increased to 72%. On top of this, 16% of these mobile-friendly emails lead users to websites that are not optimized for mobile devices. Why is there such a disconnect between mobile device users and mobile-friendly websites and emails? Hopefully, email marketers will soon begin to recognize that adapting their content for mobile-friendly users is in the very near future of email marketing. Maybe one day soon, it will even become the standard for emails and websites. Another key finding from Adobe’s Email Survey 2016 is the trend towards less formal emails. 36% of the surveyed Europeans have noticed a pattern of less formal emails. So, what does this mean? Well, 30% of survey respondents agree that emails are getting shorter in length. 73% of respondents have started using emojis in their personal emails, and 33% now use them in their work emails. But, additional survey results may prevent you from using emojis in your email campaigns any time soon, as 72% of the respondents considered the use of emojis in emails as ineffective in capturing their attention. It makes you wonder – is it possible that these patterns are heavily inspired by the rise of mobile users? Even though it might be a fair assumption, it is still too early to tell. Marketers – don’t be alarmed, be aware. Email is still, very much, a popular source of communication between you and your subscribers. Fortunately, the trend is expected to stay that way. The new challenge for you all is to display the content in a visually appealing and mobile-friendly way for your users, while also making sure to quickly grab your audience’s attention and turning it into a conversion. The results from Adobe’s Email Survey 2016 have given us great insight into the future of email marketing. It is likely that we will continue to see the number of mobile users rising, thus mobile-friendly emails and websites should follow suit. Knowing that nearly three-quarters of the working professionals who participated in this survey rely on their mobile devices to check their emails, it isn’t hard to see why mobile-friendly email design is the way to go. All in all, email habits are changing – but arguably for the better. Email users now have a greater reliance on email communication more than ever before, so it makes sense that their attention may be more difficult to capture. Even more, since the email channel is already quite distracted and users can receive hundreds of emails a day, marketers must strategically design their emails to capture the audience’s attention. Specifically, marketers should pay great attention to the features of the email that are visible to users even before opening. Your users have seen it all and now they know what to avoid. In order to keep providing interesting and personalized content to your users, it is time to adapt to the changing preferences of your audience.